Why don't you create a dedicated topic for MYQ? Asian equities were mixed on Wednesday, June 6, with the Japanese and Australian markets trading moderately higher while concerns over trade deals remained at the bottom. The Nikkei 225 rose, with energy-related companies recovering slightly after the last session's crash. Technology stocks also advanced, thanks to the gains of their U.S. counterparts. Hong Kong's Hang Seng index is up. Technology contributed to this rise, while continental markets declined slightly. The S&P/ASX 200 was strong, driven by gains in core resources and oil producers. South Korean markets closed on Wednesday. The slight gains in Asia were due to a mixed close on Wall Street, with the Nasdaq reaching a record high. Technology firms contributed to these developments, while other sectors came under pressure amidst continued concentration on trade tensions. There are more jobs than people without jobs, something the U.S. economy has never experienced before. The economy could continue to expand for several years to come, but the Trump Administration's trade policy may be what will stop the recovery. The technology sector and hardware giants like Apple are the most vulnerable to a possible increase in tariffs between the United States and China. Apple's supply chain has long been entrenched in China, and the country represents Apple's second largest revenue stream after the United States. Cook told President Trump last month, at a meeting at the White House, that raising tariffs was the wrong approach. 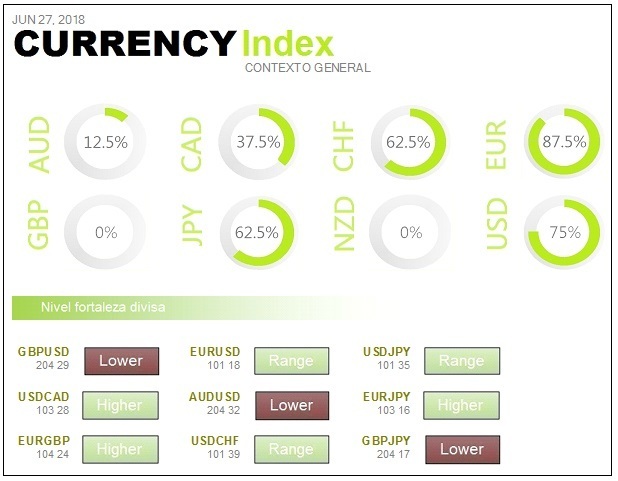 The EUR held steady during Wednesday's Asian session as investors began to focus on next week's European Central Bank meeting and as concerns about the US unilaterally withdrawing from its trade agreement with Canada and Mexico mounted. Oil prices in Asia rose on Wednesday to move away from the previous session's lows. It does so after the data showed a drop in oil inventories. Gold prices rose, while US dollar and Treasury yields declined amid persistent concerns about global trade. Wall Street recorded very moderate gains on Tuesday, June 5. The technology index continues to be the real driving force behind the New York Stock Exchange and has already appreciated by 10% so far this year. Investors are also paying close attention to oil prices. The price of crude oil has turned around and is trading lower. It falls after the United States has been known to increase its production to 10.47 million barrels per day and expectations of increased OPEC supplies. At the macroeconomic level, good data on the evolution of the services sector during May. The service ISM has risen to 58.6 from 56.8, above the 57.5 forecast. Italy and the trade war endanger Europe. Difficult session on Tuesday 5 June in the European market, which ended far from the maximums zone, with Italy and Spain in negative. The reason for this is that the fear of Italy again overlaps with the fear of the trade war and the respite in the periphery debt market has been short-lived. The British government has sold one more stake in one of the banks it had entered with the crisis and the sale price is below the market price. As soon as the problems of Italy, Spain and the United Kingdom have been brought together, the falls have become widespread. Microsoft and Apple seem to be the ones pulling the plug on the technology sector. Services sold over the Internet are becoming increasingly important. The market continues to give more importance to the technology sector as a creator of added value. In addition, Twitter is having an increase of more than 4%, once it has been confirmed that it will be part of the S&P 500. The combination of macroeconomic data and technology is putting the tension of the trade war on the back. Putting it on the back makes this last factor seem unimportant, but time will again make the trade war the focus of attention. The Prime Minister of Italy has made a speech that promises a radical change. After the same one everybody got scared. Italy's 10-year bond future falls 132 points and Spain's 32 points. The banks have problems and it is the worst supersector of the day, with a sharp drop of 1.4%. UK banks are also damaged by more sales of government positions in intervened banks. The growth of private sector activity in Spain accelerated in May, despite political uncertainty. This is reflected in the composite PMI index, which stood at 55.9 points, compared with 55.4 the previous month. It records its best reading of the last three months, according to data from IHS Markit. CNBC's Jim Cramer knows that the market cannot be driven by FANG alone, that is the acronym for the actions of Facebook, Amazon, Netflix and Google, now Alphabet. If you want to understand the power of the Nasdaq, you need a new acronym. It will be INJFANG. There are changing investor sentiments about the semiconductor space regarding Nvidia's shares. This company manufactures chips for data center, artificial intelligence, driverless automobile, automatic learning and video game industries. Microsoft's actions also help push the Nasdaq to new heights after the company announced it would acquire GitHub, a code creation and management platform for software developers. Asian equities rose on Thursday, June 7, with Japan leading the way. They followed in the footsteps of Wall Street, which advanced strongly, in a session in which the Dow Jones industrial average surpassed 25,000 points. The Nikkei 225 rose as stocks in the banking and financial sector advanced. Car manufacturers also rallied and the yen continued to trade around 110 against the dollar. In South Korea, banks and steel companies rose, but profits were limited by the downturn in the technology sector. Australia's S&P/ASX 200 advanced, with large mining companies such as Rio Tinto and BHP in positive territory. Public services and gold producers were downgraded. At the G7 summit there will surely be talks on trade agreements. Larry Kudlow, director of the National Economic Council of the United States, thinks it will be the ideal framework for reaching agreements on key issues. U.S. stocks rose on Wednesday, June 6. The financial sector improved in the face of the prospect of higher interest rates. Boeing was also very supportive. The Dow is up 300 points as JP Morgan and Goldman Sachs lead. Meanwhile, the Nasdaq also closed at the top and reached an all-time high, as the technology regained its previous losses. However, profits in technology companies were limited after the Financial Times reported that the European Union would reveal a negative result from a Google investigation. Technology has been climbing more than 6 percent in the last month, to an all-time high. Industry leaders include Advanced Micro Devices, Micron Technology and Microchip Technology chip manufacturers. PayPal, Electronic Arts and Facebook have also skyrocketed in the last month. The EUR rose to a two-week high against most of its major counterparts on Thursday, as the European Central Bank (ECB) may announce the end of its economic stimulus package by the end of the year. Central Bank Chief Economist Peter Praet, a close ally of President Mario Draghi, said the ECB will discuss next week whether to stop buying bonds by the end of the year. Oil prices rose during the Asian session on Thursday, to recover from some of the losses of the previous session. They have been supported by the fall in exports from Venezuela, which is a member of OPEC. Gold prices rose to a two-week high as investors look forward to major central bank meetings and the U.S.-North Korean summit. The Dow Jones is taking over from the Nasdaq push. The Nasdaq is not having too much wind in its favor on Wednesday June 6 because, on the one hand, Facebook is having trouble getting past the annual highs and Twitter is in negative after announcing that it intends to place convertible debt. Twitter's shareholders have not taken it too well that the value of their shares may devalue. Weekly crude oil reserves are improving by 2.07 million barrels, when a drop of 1.7 million was expected. This is clearly a bearish figure for the price of crude oil. China and Europe continue to seek negotiations and will talk to the Trump Administration during the next G7 meeting. Everything that means negotiating is positive. While one thing is said on the one hand, on the other hand it is warned that sanctions in the form of tariffs on the import of goods from the United States will be implemented in early July. 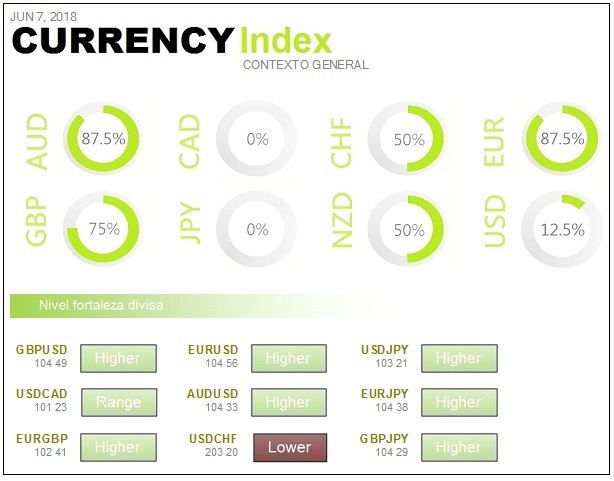 The main currency market player is the euro. 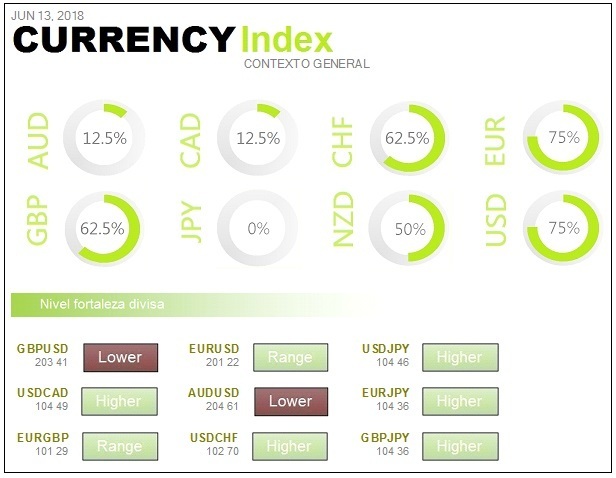 The dollar is not behaving well on Wednesday, June 6, as the euro is the main currency market mover. The European Central Bank is increasingly convinced of the convergence of inflation with its outlook. In addition, they would be thinking about deciding when the quantitative programme should end. While it is true that oil could correct something else, what is undeniable is that the medium-term upward trend remains intact. Very few people remember that the price of oil was close to 160 dollars a barrel four years ago. The bad thing about looking only at the short term is that the noise and the news of everyday life prevent you from seeing the forest. In fact, technically, oil has remained impeccably bullish since it hit the ground running at $30 a barrel in early 2016. What's more, there is a potential bullish channel that could end up raising the price of crude oil to the top, with the barrel at 86 dollars. The European Central Bank will return to work on 14th June in Riga. It will do so after a meeting in April that gave little indication of the regulator's future decisions. One of the members of the Governing Council, Peter Praet, assured that the debate on the end of the asset purchase programme will be one of the main points of the September meeting and with inflation returning to the Eurozone scene. The European Central Bank will no longer spend €30 billion a month on the purchase of bonds. However, just three months after such a scenario, Mario Draghi has not confirmed anything. The idea of extending purchases 'further if necessary' continues to appear in the entity's message with each new announcement. That Nick Clegg, the former British Deputy Prime Minister, is a fervent opponent of Brexit is no secret. The former leader of the Liberal Democrats has argued against the divorce between the United Kingdom and the European Union. He warned of the dangers of protectionism in abandoning agreements with the European Union. In the absence of the latest appointments, Pedro Sánchez's government team for Spain presents itself as Europeanist, experienced, anti-secessionist, feminist and without a populist trend. Asian equities fell on Friday, June 8, as investor sentiment became slightly cautious following recent gains earlier in the week. The Nikkei 225 finishes almost flat after four straight sessions of winning. The financial sector was weak, while private consumption rose. Australian stocks also changed little. South Korea's Kospi fell as car manufacturers and technology stocks fell. Hong Kong's Hang Seng index lost, as technology and finance weighed heavily. Investors turned to bonds amid concerns about emerging markets. U.S. government bond prices rose in the last session. On Friday, the yield on ten-year US Treasury bonds stood at 2.94%. In Wednesday's session it was at 2.97 percent. Wall Street will again increase the risk of its investments after the change in banking rules. Goldman Sachs and Morgan Stanley will lead the way. During the financial crisis, there have been large pockets of risk within banks, and this could increase with the changes proposed in the Volcker Rule. Privacy issues are again becoming known in technology companies. A Facebook error made public the private messages of fourteen million users recently. The Dollar fell to a three-week low against most of its major counterparts on Friday as U.S. and the EUR recovery remained intact. In addition, the European Central Bank is expected to start reducing its stimulus programme. Oil prices rose on Friday. They were driven by Venezuela's efforts to meet its supply obligations and by continued production cuts, led by the OPEC producers' cartel. Canada is now pushing the Trans Mountain pipeline to sell its oil to China. It intends to expand its clients in the face of the open trade war with the United States. Gold remained unchanged during Friday's Asian trading session, while investors were wary of key events such as the U.S. Federal Reserve meeting and the U.S.-North Korean summit. NASDAQ accelerates losses and cuts Dow Jones gains. The Dow Jones has tried to cheer up the session on Thursday, June 7, by compensating the Nasdaq, but the technology sector is accelerating losses and is weighing on everyone. Facebook has not managed to break the year's maximums and continues to fall back. It has generated important sales in the technology index and these sales managed to cut the advance of the rest of the indices. In favor of the United States we have the new increase in the price of oil, however, weekly unemployment claims remain very low. Italy warns that it is still present. Complicated session on Thursday 7 June, where the European market has gone from more to less. The financial sector was going up when it saw that the European Central Bank might join the Federal Reserve by making things a little more difficult for financing. This favours interest rate hikes in the secondary market and also gives the Euro more strength. Amidst the relentless geopolitical turmoil in Washington and elsewhere, technology stocks have been like an island to which investors have been able to withdraw and make big profits. It should be noted that the industry has benefited from some significant risks, but the technology may benefit more than any other industry if Trump's business strategy works. Tax cuts have put more money in shareholders' pockets, through a historic surge in share buybacks, and corporate profits may be peaking. He is referring to the need to maintain a tone of courtesy towards the United States. More or less on the line that North Korea and China have been following. He says that tariffs on metals are unacceptable and notes that there is increasing pressure within the United States against such measures. He believes that they must be frank with the American president and that they will continue to say aloud that they are not happy with these actions, but always within a context of cordial courtesy. He says we must remain courteous and try to convince the United States that the allies' arguments are strong and that they need each other. A trade war will impact, first of all, on American workers. You can't wage a trade war between friends. The G7 will try to convince Trump to normalise trade relations. If the United States decides to withdraw from its global role, it will be bad for the American economy and its image. The situation is improving in both Italy and Spain. Prices rise and yields are contained. Auctions have been held in both France and Spain. There has been an increase in demand and yields have not moved much. What is certain is that, as things are going with the new government of Spain, the sector is calming down because it does not look like a government of confrontation with Europe. In addition, the leader of the 5 Star Movement in Italy has said that he does not intend to raise taxes and will be very cautious with the public accounts. They seem to have got the message from the market about what would happen if there were a direct confrontation with Europe. Asian markets rose on Monday, June 11, leaving aside the caution previously observed. Investors focused on trade tensions and the historic meeting between US President Donald Trump and North Korean leader Kim Jong Un. In Japan, the rise was led by the Topix sub-index of oil and coal products, with gains also in the retail, technology and banking sectors. In South Korea, the manufacturing sector advanced. The Shanghai compound fell due to the fall of banks and the energy sector. U.S. equities closed higher on Friday and major indices ended the week in positive territory, despite caution about trade-related tensions at the G-7 summit, which ended Saturday. The Trump administration has applied tariffs on aluminium and steel to several G-7 members prior to the summit. As a result, German Chancellor Angela Merkel said the European Union is preparing its own countermeasures against the United States. President Donald Trump asked Friday that Russia be invited back to the meetings of the world's economic powers, a statement that could further isolate him from U.S. allies. Moscow was expelled from the G-8 group of countries after the annexation of the Crimea in 2014. At the time, the measure led to global condemnation and multilateral economic sanctions. The G-7 meeting over the weekend was not good for the feeling of risk. Despite the fact that the market's reaction only affected the Canadian dollar. The summit between Trump and North Korean leader Kim Jong Un is expected to take place in Singapore on Tuesday. Both arrived in the country on Sunday and are ready to make history as the first leaders of their respective countries to meet face to face. Most analysts do not believe that the markets will be substantially affected by the meeting. The Canadian dollar fell slightly during Monday's Asian session after opening the week with a strong bullish gap. It does so after the President of the United States destabilized the G-7's efforts to show a united front. The EUR rose as traders now await Thursday's ECB monetary policy meeting. Everyone expects to know when and how they will liquidate their bond purchases and raise interest rates. Oil prices fell during Monday's Asian session, dropping as U.S. oil drilling activity rises to its highest level since March 2015. The increase in production in Russia also weighed heavily on the market. Gold prices rose sharply on Monday as the U.S. dollar was affected by the U.S.-North Korean summit and fears of a trade war were heightened in the G7. There has been a revision of the growth forecasts for the United States. The Federal Reserve in New York made a downward estimate of the US economic outlook on Friday 8th June. Technology has been another of the problems of the day. While running as a candidate, Trump promised that his policies would push the economy toward an estimated 6 percent growth. It remains to be seen if he will succeed. At the G7 meeting, it looks like everyone is going to make a common front against the United States. They want to stand up to you and tell you that tariffs are not the way forward. They are all within the cordiality, but they will remind the United States that it has to follow the role it has played in recent times and that seeking a new role greatly complicates the situation at the global level. Negative session on the periphery and waiting for events. Another negative session in Europe on Friday 8 June. The political problem in Italy remains a focus of attention. Italy was among the worst of the day, with a rebound in 10-year secondary market interest rates of over 3.12%. The debt in Spain has not gone better. The future of the 10-year bond in Italy has fallen 156 points, but the Spaniard has lagged behind with a fall of 45. This has made the banking sector one of the worst. German Finance Minister and Deputy Chancellor, Olaf Scholz, argues that European unemployment insurance would complement the national systems that would support in times of major crisis. The Iranian government has categorically rejected the possibility of talks with the United States on a new nuclear agreement to replace the one reached in 2015 with the 5+1 Group. With this pipeline, it aims to sell oil to China, and it will go far beyond the coasts of the United States. As it fights for tariffs with its large southern neighbour, Canada is looking for new markets for its oil to the west. In the midst of a bitter trade dispute with the United States, which is the only customer of its oil so far, the Canadian government has chosen to buy a pipeline project that will bring more than double the oil it can ship. Analysts say ironically that it could help Canadian Prime Minister Justin Trudeau find some support after the confrontation between the province of British Columbia and Alberta, which has sparked protests across the country. Some 14 million Facebook users, who thought they were sending their messages only to friends or private groups, may have been sharing them with the general public. A software error has caused this situation, according to the Company. A Facebook user's message usually has a preset privacy setting. However, an error that was active from May 18 through May 27 changed the status of the messages to make them automatically public. Asian markets rose on Tuesday 12 June as a historic meeting between the US president and the North Korean leader took place in Singapore. The central bank meetings, which will take place in the coming days, are also weighing heavily on the markets. The Japanese Nikkei 225 rose to its highest level ever, while the Japanese yen reached intraday lows. Other markets in the region underwent little change, with Australia's S&P/ASX 200 and Hong Kong's Hang Seng index rising. The energy and services sectors led the way. The Dollar rose to a three-week high against the Yen. The U.S.-North Korean summit may be the way for a reduction in tensions between the two old rivals and has been a major factor in the movements originating in Asia. U.S. President Donald Trump has said he has a 'good relationship' with North Korean leader Kim Jong Un as his two countries seek diplomatic progress at the historic Singapore summit. Chinese diplomat Wang Yi says his country is celebrating the historic summit held in Singapore by Donald Trump and Kim Jong Un and is confident that both nations can reach an agreement that will lay the groundwork for the start of denuclearization and the establishment of a peace mechanism on the peninsula. It also highlights the role that China has played in the negotiations by promoting dialogue between the two Koreas and facilitating today's historic meeting. Donald Trump says it's a very important document that he's honored to sign, while Kim Jong Un says it's the beginning of a new global era ahead of us and thanks Trump for his efforts. Much of the currency movement has come from algorithmic programs, rather than from the summit itself. However, the Dollar/Yen will remain stable as long as the summit ends with a good feeling. A successful outcome of the U.S. talks with North Korea could boost Chinese markets, according to a study analyzing financial markets' reactions to past events with respect to North Korea. A disappointing result could harm European actions. The Federal Reserve has a surprise in store that could mean an early end to the interest rate hikes. It holds its two-day meeting, starting June 12, and is expected to raise interest rates for the second time this year. The focus, however, is on whether the central bank will insinuate further increases or not. The European Central Bank is also meeting on June 14 and could signal its intention to begin to reduce its massive bond buying program. The Bank of Japan will also end a two-day meeting on Friday, when it is expected to keep its relaxed monetary policy intact. Oil prices rose, along with global markets, during Tuesday's Asian session, thanks to optimism about the outcome of the meeting between Donald Trump and Kim Jong Un in Singapore. Gold prices fell sharply on Tuesday as the Dollar rose. The U.S.-North Korea summit and possible interest rate hikes by the Federal Reserve are weighing heavily on the agenda. Wall Street opens the week with tight and cautious moves. The historic Trump-Jong Un Summit and the Federal Reserve's monetary policy meeting are awaited with interest. This week, the FOMC, the Federal Open Market Committee of the Federal Reserve, is meeting with almost unanimous consensus expecting a further 0.25 point rate hike. Last weekend's G7 meeting resulted in a worsening of US relations with the rest of the participants. Especially Germany, and Europe in general, in the face of Trump's refusal to reconsider his protectionist stance. It is a very advantageous position for the United States over Europe, where trade tensions will cause the most damage. The Fed and ECB meetings will be very important, but the fact that the quarterly maturity of derivatives will take place next Friday is a reason to increase caution. Critical issues for the European Union. The session on Monday 11 June ended positively in Europe. The changes of political leaders in Italy and Spain, towards less stable positions than the previous ones, are critical issues for a European Union. Many fronts are at stake, including great banking fragility, in a worrying environment of economic slowdown that began last November. This week the Federal Reserve may surprise investors. It could put an early end to interest rate hikes. Along with a quarter point increase, the Federal Open Market Committee is likely to announce another change that would lead to an early exit from its historic program to reduce the level of bonds remaining on its balance sheet. They suggest that the programme could be closed next year or early 2020 at the latest. Instead of reducing the balance sheet from $4.5 trillion it will end the period with $2.5 trillion. Germany's leading industry association, DIHK, says the G7 summit was a fiasco that demonstrates how some policies can be transformed into trade barriers. He warns that U.S. sanctions in Iran, Russia and other regions will have an additional impact on Germany's economy. The escalation of trade disputes adds a factor of uncertainty to German companies' investment decisions. Iraq's oil minister says oil prices need more support and stability. He adds that he does not exaggerate if he assures that the greatest need in the market, right now, is a greater supply. It assures that Iraq has complied with the production cuts pact implemented in 2016 and was one of the main drivers of the extension adopted at the end of 2017. It therefore rejects outright the decision of some countries to increase production unilaterally, without consulting the other OPEC members. Crude oil has started the week with falls, under pressure from rising U.S. production. Friday's Baker Hughes data gave the highest number of active refineries since March 2015. Industrial production in the United Kingdom in April fell from +0.1% to -0.8%. It is worse than expected, which was an improvement of +0.2%. In the face of the Brexit and the trade war, the declines are very dangerous. Asian markets relaxed during the session on Wednesday, June 13, as investors moved from focusing on the recently concluded U.S.-North Korean summit to the conclusion of the June Federal Reserve meeting. Japan's Nikkei 225 rose, with gains for the transport sector and utilities. The basic materials sector lagged behind, while car manufacturers rose. The S&P/ASX 200 fell, with most sectors trading in negative territory. The financial sub-index fell and core resources also suffered. Global markets have fallen after Tuesday's meeting between US President Donald Trump and North Korean leader Kim Jong Un. The summit, which took place in Singapore, marked the first meeting between the leaders of the two nations. The Korean conflict will soon end, according to Trump, after a historic summit with North Korean leader Kim Jong Un. ‘Opponents can become friends'. Trump and Kim signed an agreement to work toward complete denuclearization and a lasting peace regime on the Korean peninsula. The U.S. dollar rose to a three-week high against the Japanese yen on Wednesday and held steady against the euro on Asian trading. It does so while awaiting the Federal Reserve's meeting to release the U.S. monetary policy figures. On Canada, Trump says Trudeau's remarks after the G7 meeting will cost Canada a lot of money. He believes that the statements made by the President of Canada were disloyal and did not correspond to the atmosphere of the meeting. Oil prices are falling in the face of an increase in supply. Expectations that voluntary production cuts, led by the OPEC producers' cartel, could be relaxed are having a decisive influence on the latest oil price cuts. During Wednesday's Asian session, gold changed little, before the US Federal Reserve's decision to give clues about future interest rate hikes. North American markets on the rise at the beginning of the session in a day with few macroeconomic references. The historic summit between US President Donald Trump and North Korean leader Kim Jong-Un took place on Tuesday 12 June. It was a meeting that was embodied in a document that laid the foundations to begin the process of denuclearization of the North Korean regime and the commitment of both leaders to continue the dialogue and negotiation of the peace process on the peninsula. Investors are now looking ahead to the Federal Reserve's two-day meeting, which will end on Wednesday with a further rate hike to 2%. This would be the second one so far this year and also the second one of the Powell era. Crude oil is turning around and trading at a moderate rate, following the progress made during the European session, following the breakdown of a pipeline that has paralysed crude oil exports in Nigeria. European squares on the rise encouraged by geopolitical optimism. A day on Tuesday 12 June, when investors look to the United Kingdom, where Theresa May's Brexit disconnection law reaches parliament. There are reports that the premier would have reached an agreement with the most pro-European of her own party. He thanked Japan's Prime Minister Shinzo Abe and China's Prime Minister Xi Jinping for making this summit possible and providing a better future for the citizens of North Korea. He says Kim has transferred him that he has begun to destroy his nuclear test plants and hopes that the process of destroying weapons can begin very soon. Trump assures that the economic sanctions on North Korea will continue to have an effect for a while, until the denuclearization process is verified. The United States will not offer concessions on this issue. Trump says he has invited Kim to visit the White House and that he has accepted, ensuring that he will come at the appropriate time. In addition, he says he is certain that one day he will visit Pyongyang. An OPEC spokesman assures that the organization has not received any official or unofficial communication from the United States to increase its production in June's meeting. Crude oil is reducing losses, although it is still under pressure from the increase in production seen in the US last week. Italy is not expected to be a crisis for the euro area. Nowotny warns that the situation could be financially difficult for France. The reason is that both Credit Agricole and BNP Paribas have high credit exposure in Italy. He made no mention of the European Central Bank's monetary policy, as he was unable to make such comments in the run-up to Thursday's meeting. The ZEW Institute notes that the escalation of trade disputes with the US and the possible destabilisation of eurozone policies are behind the fall in investor confidence in the German economy in June. The outlook for the German economy over the next six months has deteriorated significantly. Weaker than expected data on exports and industrial orders also contributed. Asian markets fell on Thursday, June 14, after the Federal Reserve raised interest rates. It was a widely expected move and, furthermore, they indicated that two more rate hikes were likely in 2018. In Japan, mining stocks fell, as did most other sectors, although banks and transportation clung to profits. In South Korea, car manufacturers were in a downward spiral. In Australia, gains in materials and telecommunications were offset by a decline in the financial sub-index. Utilities stocks fell after rising in the previous session. In Hong Kong, the consumer goods and materials sectors led the losses. The Federal Reserve raised rates by a quarter of a point to 2%, as expected by the market, and points out in its statement that it sees two more increases until the end of the year. There are four in total and three additional in 2019. It was a unanimous vote. The Fed assures that growth remains strong, changing its earlier message that growth was modest, and assures that rate hikes should be gradual and in line with economic growth. They predict a strong labour market and inflation of close to 2%. They maintain their forecasts for GDP growth of 1.8%, unemployment rate at 4.5% and inflation at 2%. With the latest interest rate increase of a quarter of a point, the seventh in two years, some consumers could be left in a compromising situation. Over time, that cumulative effect is growing. For the average American, recent signs of inflation, which pushed the central bank to raise rates from 2015 onwards, are not necessarily bad. It is generally considered an indication that the economy is doing well and paves the way for increases and better returns on your savings. However, in everyday life, higher interest rates mean that you will have to pay more to have access to credit. That includes credit cards or home equity lines of credit. The Dollar declined on Thursday's Asian trading session, after a three-week high against the Yen. It quickly erased gains after the Federal Reserve adopted a more aggressive policy tone by signaling two additional rate hikes before the end of the year. Oil prices fell during the Asian session on Thursday. They were dragged along by increased production, although strong demand and falling U.S. fuel inventories provided some market support. Gold fell on Thursday as the Federal Reserve predicted two more interest rate hikes in the U.S. this year after raising rates on Wednesday. Persistent concerns about trade tensions between Washington and Beijing prevented further losses. The main focus of the session was the technology sector. Wall Street is very focused on the concentration of audiovisual media looking to join forces to confront Netflix. This company is the one that has pulled up the FAANG+, also supported by a new upward momentum of Twitter. Therefore, it boosted technology in Europe and also in the United States on Wednesday 13 June. The composite Nasdaq has created a new historical high. The oil companies have had problems, after it was known that the weekly oil reserves in the United States have fallen much more than expected. They have fallen by just over 4,000,000 barrels and the price of crude oil has risen to over 66.5 dollars a barrel. Technology pulls the market back on hold waiting for the Federal Reserve. A mainly bullish session in the European market on Wednesday, June 13, which has gained in strength as the U.S. opened the session. The optimism aroused by the meeting between the United States and North Korea has disappeared because nothing they have agreed on is concrete. Now investors are focusing on the Federal Reserve. It will probably do so at 25 basis points, up to the range of 1.75% - 2%. This is how the market discounts it with a possibility of more than 90%. It will be the seventh rise in interest rates in the United States since monetary normalization began under the 'Yellen era' and the second in the 'Powell era'. 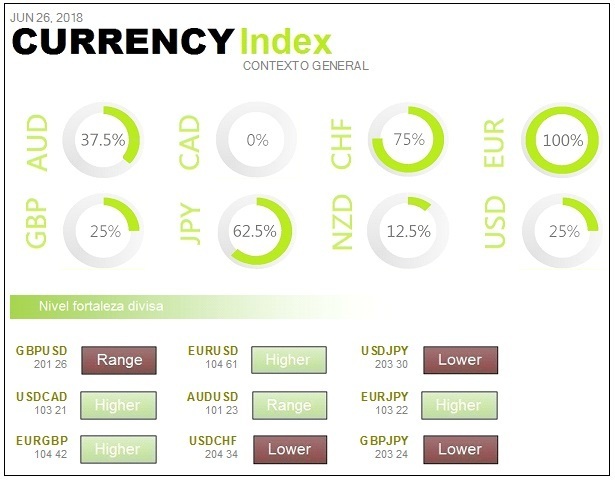 Another of the major references that the market is watching is the behaviour of the dollar in the foreign exchange market. It should be remembered that the euro/dollar exchange rate will also be heavily influenced this week by the European Central Bank's monetary policy meeting on Thursday. Analysts do not agree on whether Mario Draghi will offer any clues about the end of the quantitative easing program. There are many keys to analysing the Fed's message, but one of the most closely watched indicators by traders is the yield on Treasury bonds. The US ten-year Treasury bond yield remains at 2.96%, after peaking at 3.12% on 18 May 2011. The US two-year bond yield remained at 2.55%, having risen sharply from 1.27% in September. The fact that the gap between the two references has narrowed significantly is a cause for alarm. The latest recessions in the United States have been preceded by an inversion of the yield curve of these bonds. The definition of capitalism in the United States needs to be updated, because of the inequality caused by the difference in income. Says the billionaire hedge fund manager and philanthropist, Paul Tudor Jones. Trudeau gave a press conference complaining that Canada will not be pressured by the United States. The press conference was considered by Trump to be a lack of loyalty, as he believes they had a good relationship at the G7 meeting. Asian markets were mixed on Friday, June 15, with investors waiting for the release of US tariffs to China. On Thursday, the European Central Bank (ECB) announced changes in its bond purchase program and there were significant changes in the currency market. In Japan, oil-related companies traded higher, pharmaceutical stocks also rose. South Korea's finances fell, while retailers rose slightly. In Australia the S&P/ASX 200 went up. Investors in China were expectant of the Trump Administration's tariffs. The Shanghai composite index is down. Hong Kong's Hang Seng index fell slightly. The markets in Indonesia, Malaysia and Singapore closed on Friday. The White House plans to introduce tariffs on a reduced list of Chinese exports on Friday. It is expected to include between 800 and 900 products, compared to the original list of about 1,300 products published by the U.S. Trade Representative in April. The dollar value is unclear. The U.S. economy is growing at close to 4 percent in the second quarter, a level President Trump had been aiming for since last December. On Thursday, the European Central Bank announced changes to its quantitative easing plan. The Bank said that if economic data continued as predicted, the monthly bond purchase program would continue until the last quarter of the year, but in a slower pace. The EUR recorded its worst weekly losses in 19 months on Friday, following the European Central Bank's press conference. Oil prices changed little at the beginning of Friday's Asian session as investors look forward to a key OPEC meeting in Vienna. Saudi Arabia and Russia indicated that they wanted production to increase. Gold was trading strongly at the beginning of Friday's Asian session, after reaching its monthly high in the previous session. The European Central Bank's decision to keep interest rates stable throughout the summer of 2019 and the commercial concerns that are on the horizon have a great deal of weight in the evolution of safe haven assets. 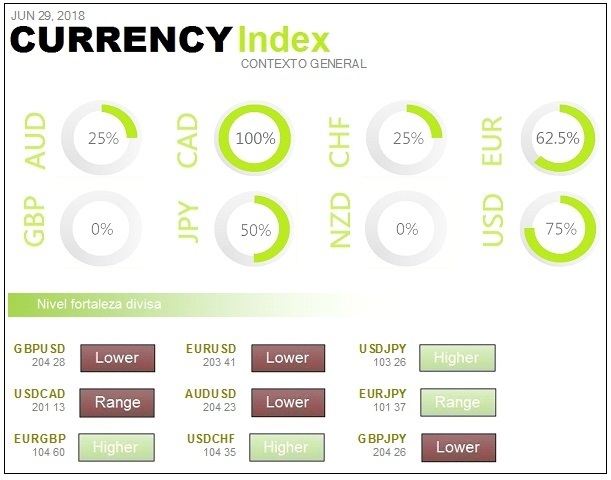 Risky assets are expected to strengthen on Thursday, June 14, after the European Central Bank (ECB) announced its new intentions. In principle, they did not talk about raising interest rates. In addition, they say that in September they will reduce the quantitative programme and cancel it definitively in December of this year. With that news the euro plummeted, because they were thought to be a little more aggressive. In addition, they have given the first growth prospects for the coming years with reductions, due to uncertainty and the possible trade war. This generates a divergence of perspectives between the United States and Europe. Now all eyes are on the quarterly maturity of derivatives on Friday, June 15. There may be manipulations in the next few hours and it will be Monday when the real face of the market will be seen. Attention to derivatives maturities. It arrives on Friday of the third week of the third month of the quarter. There will be movements to keep the option market from getting out of hand for large investors. We will have a rather complex situation to master and the ideas will only be a little clearer next week, when the market will be free again in the medium term. At 12:00 hours is the maturity of Eurostoxx futures. At 1300 hours, the DAX futures are due. Until then we'll have upward or downward manipulations. From then on the market will follow its natural course. It remain at 0%. However, they have already offered their first changes in the post-decision communiqué. They anticipate that the withdrawal of stimuli will be undertaken between September and December. On that date, monthly asset purchases will be reduced to €15 billion from the current €30 billion. In addition, they change their phrase that...'Types will remain at current levels for an extended period of time' to... 'At least until the summer of 2019'. This is the first time that the Central Bank talks about a possible date to start raising interest rates. The euro, which was initially strongly boosted, has now turned around and is trading sharply lower. Monetary policy must remain accommodative until it ensures that inflation remains sustained at the 2% target. The Governing Council is ready to start adjusting monetary policy instruments and, until now, its decisions have had the unanimous support of all members. On the eurozone economy, Draghi says that economic growth was moderating due to temporary factors. Russia's energy minister Novak says OPEC could consider increasing production by 1.5 million barrels a day at the next meeting on June 22. He also says he supports the Saudi Arabian energy minister's idea of a smooth exit from which the details will be discussed in Vienna. He adds that there are oil-producing countries struggling to increase oil production. Most Asian markets fell on Monday, June 18, as the escalation of U.S.-China trade tensions was digested after both countries announced tariffs last week. In Japan, all sectors were downgraded. Shippers led losses, steel manufacturers fell and oil companies fell amidst a prolonged fall in oil prices. In South Korea, car manufacturers traded higher, but technology prices fell. In the S&P/ASX 200, declines in the materials and energy sub-indices were offset by gains in the financial sector as Australia's four major banks traded higher. The markets in China, Hong Kong, Taiwan and Indonesia closed on Monday for holidays. Trade war concerns are likely to have the biggest impact on market performance after the Trump administration said last week that it will impose a 25 percent tariff on a list of 818 items of Chinese goods worth about $34 billion starting July 6. In response, China said it will implement a 25 percent tariff on U.S. products, including soybeans and electric vehicles, worth $34 billion starting July 6. Another list of US imports worth $16 billion will be subject to review before being implemented. These movements pose risks to the global economic recovery. The latest problems on the trade front led to widespread declines on all exchanges. The U.S. Dollar rose to a seven-month high on Monday as investors were still betting that the U.S. and China would avoid a trade war. The reason the dollar is behaving this way is because while a trade war is bad news for everyone, it is even worse for the countries involved. U.S. oil prices fell on Monday after China threatened to impose tariffs on U.S. oil imports. Gold prices rose sharply on Monday, after reaching a five-and-a-half month low during the previous session. The trade dispute between the world's two largest economies prompted the purchase of safe-haven securities. Dow Jones Down 1% on Trump's Tariffs to China. The Dow Jones fell by 1% on Friday, June 15, after the new episode of the trade war between China and the United States. It comes after the approval of $50 billion worth of tariffs. The S&P 500 and Nasdaq losses are more moderate. Trump makes his threats. He is not influenced by those voices that warned him that a rise in trade tensions could derail the relationship between the two nations, at a time when the United States is in the process of pressuring North Korea to dismantle its nuclear weapons program. The indirect effects of these tariffs on business confidence and investment act as taxes on consumers because they raise the final cost of consumer products. The trade war is already the main concern of the market. Very negative session in the European market on Friday 15 June. There is too little energy left to devote a bullish momentum to the quarterly maturity of derivatives. The point is that, following the growth and inflation forecasts and the ECB's announcement that the quantitative easing programme would be reduced, the sharp fall in the euro led to an upswing in risky assets. He says he sees a risk that the trade war and immigration policies could clog the capacity of the U.S. economy. He also says that the country's fiscal path is unsustainable and could affect interest rates until 2020. Trump's main strategy is to use the trade war to win deals that are advantageous to his country, taking advantage of the strength of its economy. The greater the difference between the performance of the American economy and the rest of the world, the more the Trump Administration can demand. The stronger the U.S. economy is, the better it can withstand retaliation. The danger posed by the US commercial strategy becomes the first danger for everyone. It will be Monday, June 18, when there are no more due dates ahead, when the real intentions of the market will be seen. Nor are any changes expected in their conditions in the short term. He said that the European Central Bank plans to end asset purchases by the end of the year and does not expect to raise rates in early 2019. Nowotny adds that the ECB needs to take its first steps towards monetary normalisation, but stresses that the ways in which they were announced yesterday are welcome. In addition, it ensures that the announced monetary policy decisions were fully endorsed by the members of the Governing Council and notes that the ECB should give more details of the standardisation as soon as technically possible. Trump says if there's retaliation, they'll respond with more tariffs. President Donald Trump is expected to announce quite significant charges on Chinese products worth about $50 billion. The list will include between 800 and 900 products, compared to the original list of around 1,300 published in April, and China promises a rapid response. On Tuesday, June 19, Chinese markets led the losses in Asia after the U.S. president launched a new ad in the U.S.-China trade dispute. Trump said Monday he had asked the U.S. Trade Representative to identify $200 billion worth of Chinese products that will be subject to additional 10 percent tariffs. These tariffs will come into effect 'if China does not change its practices'. China, in turn, said it would take countermeasures if the United States went ahead with the additional tariffs it had threatened. China's markets fell after that news. Other Asian markets were mixed. The Nikkei 225 fell by 1.34 per cent and the South Korean Kospi fell by 0.79 per cent. Australian equities, however, were left out of these concerns by 0.2 per cent. The Japanese currency is holding steady. The resumption of trade negotiations between the US and China boosted demand for the Japanese yen. The dollar fell against the Japanese yen on Tuesday after the U.S. president threatened to apply more tariffs to China. High trade tensions between the United States and China have made investors nervous about the trade dispute between the world's two largest economies and are having an impact on the global economy. U.S. index futures fell, with the Dow Jones Industrials below 252 points. The S&P 500's e-mini futures declined by 0.94 percent. Foreign governments withdrew their purchases of US long-term debt as trade tensions increased around the world. Declines are relatively small so far for notes and bonds, but indicate a potentially worrying trend. Oil prices fell in the early hours of Tuesday's Asian session, due to expectations that the OPEC producers' cartel and its main ally Russia will gradually increase production, following the retention of supplies since 2017. Gold rose on Tuesday's Asian trading day, while the dollar fell and Asian equities fell. Nasdaq attempts to cut short term bearish crosses on short term averages. The FAANG+ are fighting hard on Monday 18 June to lift the Nasdaq, but the collapse of Intel along with the damage to China related values is making it very difficult for them. Negative session at the beginning of this week in the European market. The same session, on Monday 18 June, saw the digestion of the end of the quarterly maturity of derivatives, which took place on Friday, and the need to face a completely different market from the one that existed before the weekend. Different because, over the weekend, China has counter-attacked the tariffs imposed by the United States. The trade war is hardening, which is gradually affecting the markets and their valuations. The ECB reduced the growth prospects for the coming years, but they did not dare to present any strong measures, in particular with regard to trade tension. Declines are widespread across Europe in risky assets and, little by little, some demand for assets that represent security is emerging. The price increases in public debt, silver and gold are appearing but not strongly. 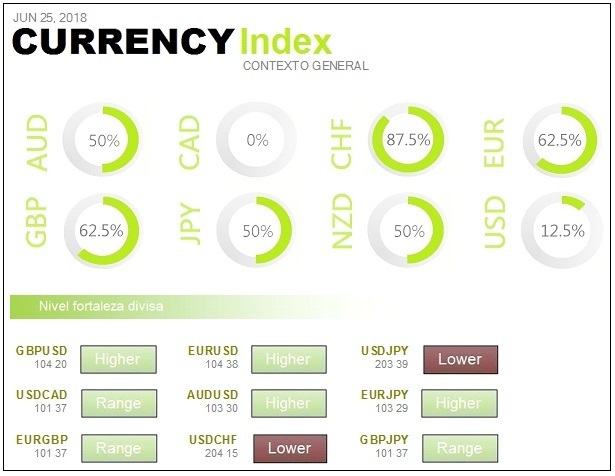 Last week was the big week for central banks and this week investors will be looking forward to the same, as a meeting of central banks begins in Portugal. Any intervention, speech or comment can move the market. He is accused of fraud and false advertising after the search of his apartment by the police over the weekend. The authorities accuse Stadler of not having prevented the delivery of the brand's vehicles throughout Europe since 2015 with devices that reduced or camouflaged pollutant emissions in a new Dieselgate scandal. The prosecutor's office estimates that 60,000 units contained these fraudulent devices. Volksawagen's titles increase losses after this news broke and fall sharply into the DAX. They are beginning to prepare for Friday's summit, at which they are expected to announce an increase in production. The increase would be 600,000 barrels per day, less than the amount being considered, which is causing a significant rebound in oil prices. Goldan Sachs predicts in a report that OPEC and Russia will increase production this Friday by one million barrels per day. However, the fall in production of other participants such as Iran or Venezuela, following the application of US sanctions, will leave that increase only at 450,000 barrels per day. In addition, the bank's analysts believe that there is still some uncertainty on the demand side. They see a global growth for this year of 1.75 million barrels per day. It anticipates a possible tightening of the market, mainly due to the pressure of increased production in the United States. They maintain that the Brent will reach $82.5 a barrel. Within the United States there is a decrease of three installations, according to Baker & Huges, which means that the figure is lower than last year. The Euro remains weak and the automotive and parts supersector is one of the worst. We can see the fear of a trade war that could do a lot of damage, not only on the American side but also because of the possibility that Europe will take advantage of the situation to mess with China and that China will respond. She says that both the CDU and the CSU have the common goal of improving the organisation of immigration to Germany and significantly reducing the number of people entering the country. Both parties also support the plan to present a master plan on immigration. She says they will not let those who have already registered in other countries into the country. She acknowledges that there has been a very serious debate but that they want to act together with the CSU. The result of the negotiations has been a strong and clear mandate from both parties and she believes that unjustifiably pushing people back to the borders of Germany could lead to undesirable domino effects. Merkel believes that the European Union's asylum policy is not only about what Germany is asking for, but also about what other countries find important. Asian equities tried to rebound on Wednesday, June 20, despite the trade war, after several markets in the region suffered heavy losses in the previous session. In South Korea, large-cap technology stocks traded higher. The Japanese Nikkei 225 moved in a narrow range throughout the session. Consumer-related stocks rose, but materials, banks and insurance companies traded lower. In Australia, the S&P/ASX 200 advanced, with most of its subscripts in positive territory. The financial sector rose by 2 per cent and oil producers also made steady gains. China has stated that "the US has launched a trade war that violates the laws of the market and is not in line with current global development trends". The Dow dropped nearly 300 points, eliminating the year's gains, as Trump threatened more tariffs on China. In the current situation, there may not be much room for error and there is a real risk that the evolution of trade disputes will begin to erode consumer and business confidence. The Dollar held steady against most of its major counterparts on Wednesday, as risk aversion rose on concerns about a worsening trade dispute between Washington and Beijing. In the Asian session on Wednesday, oil prices recovered some losses. They were supported by the fall in crude oil inventories in the United States and the loss of production capacity in Libya. U.S. crude oil inventories fell by 3 million barrels in the week to June 15, according to the American Petroleum Institute (API) in its weekly report. Gold prices fell to a six-month low on a stable dollar. On Tuesday, June 19, they extended sales from the previous session, amidst the upsurge in the trade war between China and the United States. Another problem in the current market is the plummeting price of crude oil, as the OPEC meeting with Russia is getting closer and closer. The Russians have said that their proposal is to study for a quarter how the market reacts to an increase in production of around 1.5 million barrels per day. The lawsuit could be in trouble if the trade war goes on. Important news from the New York Times that the tariffs would not apply to Apple products that are assembled in China. This is what Donald Trump has assured the Company. In Europe, basic resources are the worst. It fell by more than 2% on Tuesday 19 June, followed by technology, automotive and industrial. There is an outflow of money from risky assets and an inflow into the safest ones. 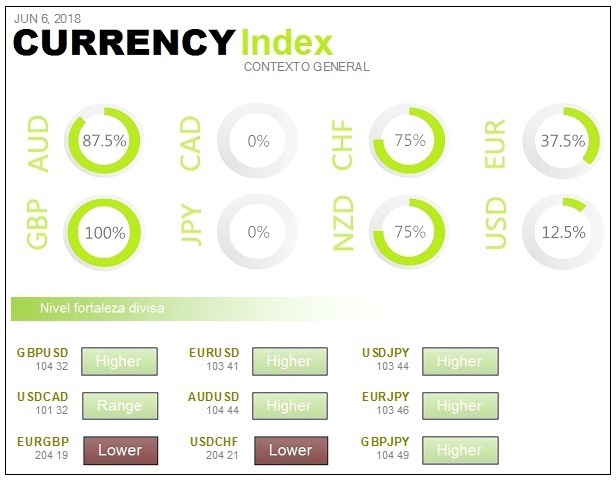 From fixed income to currency pairs where one of the parties represents security. There is no relevant capital going into gold and silver. This poses problems for mining companies and materials. The German Chancellor said she has reached a good solution with the French President for the reform of the Eurozone. It includes a common budget for the block and the conversion of the rescue fund into a European version of the International Monetary Fund. At the summit of EU leaders on 28th and 29th June the future of the Eurozone and a solution to the migration crisis must be decided. The budget for the Eurozone will be parallel to the European Union's multiannual framework and will have 'convergence between countries' as its objective. The so-called European Stability Mechanism, MEDE, is intended to provide the euro area with an extra instrument to improve its stability and to address liquidity problems. The markets are receiving the threat of the president of the United States with sharp falls. The new stance brings the worst case scenario of trade war and moves the options away from a truce. It could turn against the United States, cutting short the country's economic boom. The Beijing government has assured us that it will return the same amount. The United States and China agreed to a trade truce a few weeks ago, following Beijing's commitment to significantly increase purchases of goods and services from Washington. The initial pact now seems far from being implemented and the positions are becoming more and more distant. It is a trade war that will go global and have unpredictable consequences. He will probably inform Chinese President Xi Jinping about the last summit with President Trump. The agreements reached were supported by the suspension of the military exercises that Washington and Seoul agreed to suspend. Phones of this brand assembled in China will not suffer American tariffs. The New York Times said President Trump had reached that compromise with Apple CEO Tim Cook at a meeting last month. Asian equities were mixed during Thursday's session on June 21, as global markets calmed down after sharp declines earlier in the week on fears of a trade war. The Nikkei 225 rose slightly, with machinery stocks leading the way in earnings. Equity growth in the consumer and technology sectors contributed to the overall rise in the index, with pharmaceutical stocks also rising. Car manufacturers reduced losses during the session. Other major markets in the region recorded gains, although China changed shortly before the lunch break. Australian equities advanced more convincingly. South Korea's average share price fell as financial sector declines weighed on the index. So far, what has really been seen is not a trade war, but a trade skirmish. After all, negotiations will resume in early July. This leads to a resolution before tariffs are implemented and all equity markets would rebound in response. Analysts attributed the calm of the markets to the lack of substantial new developments in the U.S.-China trade dispute. The United States may be making some progress in its relations with other trading partners. In fact, German car manufacturers are proposing to end the EU import tax on cars made in the United States. Also, Federal Reserve Chairman Jerome Powell said the case for further raising interest rates is strong. Powell's comments came after the Federal Reserve raised interest rates by a quarter of a percentage point last week. The Dollar rose to an 11-month high against most of its major counterparts on Thursday, as the Pound fell to its lowest level since November 2017. Oil prices fell on Thursday when Iran said it could vote in favour of a small increase in OPEC oil production at the June 22 meeting. Oil is holding back progress, amid messages from different producer countries revealing differences in OPEC ahead of Friday's meeting. They are expected to announce an agreement to increase production. Gold prices rose sharply at the end of Thursday's Asian trading session, but fell to a six-month low during the session. The market doesn't get rid of the scare of the trade war. The secretary of commerce in the United States has said that Donald Trump's strategy with China is to make them see that their current behaviour will bring them more problems. Every retaliatory move by China will be matched and surpassed by the United States. Many are afraid of what will happen if China devalues its currency to multiply the U.S. trade deficit with them. Very decaffeinated session in Europe on Wednesday 20 June. On Tuesday there was a close far from the session lows, as banks gained some support from the periphery on news that the European Central Bank had proposed solutions to tackle troubled lending. The influence of the central banks on the Portugal meeting continues. Demonstrations by the President of the Federal Reserve and the Governor of the European Central Bank. Villeroy of the ECB assures that if the monthly asset purchase programme were to end in December, the first interest rate hike could come in the summer of 2019. He stresses that monetary policy remains accommodative. On Italy, he acknowledges that the policies of the new government still generate some uncertainty and recalls that, as member of the euro zone, they must be clear about the rules of the European Union. The finance ministers of Germany and France, Peter Altmaier and Bruno Le Maire, say that further structural reforms in the euro area, and more investment, are needed to secure the economic future of the European Union. They stress the defence of multilateralism, of open markets, and the promotion of an ambitious EU trade policy as the key to economic growth. It's done it in the options market. The operation is very large and has built a strategy that gives money whenever the euro drops below 1.14. Danske Bank says that in six months the euro/dollar will reach 1.20. Nowotny, from the European Central Bank, says that the fall in the euro is logical because of the different criteria of the different central banks. The U.S. president's attempt to politicize the oil market should be punished by OPEC, according to Iran's energy minister, Bijan Zanganeh. There are messages that there will be an agreement at OPEC on Friday. The Omani Minister of Energy says he sees a great deal of consensus among the members and non-members of the Agency to increase production. Russia's energy minister also says there will be an agreement on Friday in Vienna. On Friday, June 22nd, the main Asian markets were characterized by a mixed tone following the losses on Wall Street amidst investor concerns about the US-China trade dispute. Japan led the losses in Asia in most sectors. The heavily weighted financial sector rose, but these gains were offset by declines in most other sectors. Telecom stocks are down. In Hong Kong, the energy sector led the losses. This came after stocks in the US closed lower in the last session, with trade tensions between Washington and Beijing continuing to weigh on investor sentiment. The Dow Jones Industrials fell, marking the eighth straight day of losses. The Dollar fell against most of its major counterparts on Friday, after an 11-month high in previous days. 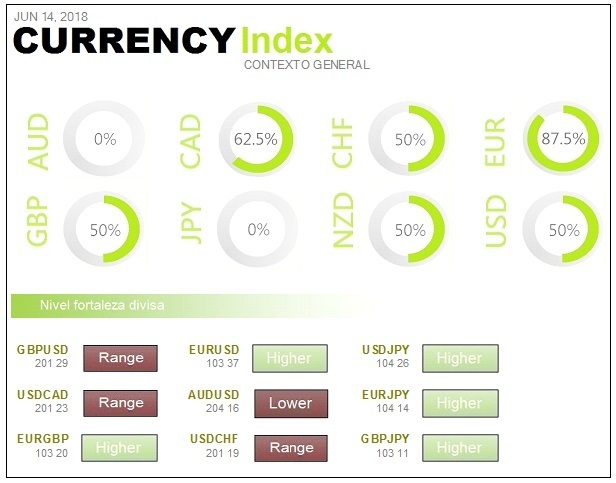 The British pound rebounded from a seven-month low after the Bank of England held interest rates and did not surprise the market in its subsequent statements. European markets are looking forward, amidst continuing tensions in the energy market before an OPEC meeting that could expand oil production. In Friday's session, all eyes will be on the Vienna meeting between OPEC members and their allies. Oil producers are expected to reduce the production cuts that have been in place since 2017. The Saudi Arabian energy minister said the consensus was that production should increase by one million barrels per day. Oil prices rose by about 1 percent on Friday. Gold remained stable on Friday's Asian trading session, after hitting a six-month low in the previous session and an 11-month high in the previous session. There has been an escalation where, every time China replicated the US tariff movement, Trump raised the stakes even higher and then there was a further increase in China's measures. China has now made a rather important move. It threatens to impose tariffs on all products created by Dow Jones industrial companies. In doing so, it is not only targeting US products, but is also attempting to downtrend the prices of investment funds that replicate the index against an entire index. This will have an impact on all investors who opt for index companies. Italy continues to call for the limelight. On Thursday, June 21, the European markets experienced a kind of perfect storm in which all the negative factors appeared at some point during the session. The backdrop is still the trade war, but there has been another episode of Italian fury against the eurozone that has made the periphery really hard with further declines in the banking sector, especially in Italy and Spain. The Bank of England doesn't go off script. At its fourth meeting of the year, the Monetary Policy Committee decided to keep interest rates at 0.5%. They are looking to August as the next most likely scenario for a rise. The absence of new growth data in the second quarter and the shadow of a busy Brexit continue to weigh on British regulators. Governor Marc Carney said earlier this year that more and quicker steps would be taken to get the pace of monetary normalization back on track. It was a promise that has not yet been fulfilled, with inflation halting its fall in May after four consecutive months of consecutive falls. The euro has reached a new annual low of around $1.15. The EU currency has been visiting unseen prices since mid-July 2017, under heavy pressure following statements by ECB Governing Council member Edwald Nowotny on the euro/dollar exchange rate. In addition, news that two Eurosceptics will head several economic committees of the Italian Senate has finally blown up the currency. ‘I see the euro depreciate against the dollar,' said Draghi, who makes it clear that the ECB is ready to enter the 'currency war' to deal with tariffs and boost inflation. The President of the European Central Bank has expressed his confidence in a gradual recovery of inflation in the euro area. He has ruled out the risk of a new economic crisis, saying that in the medium term there is no recession or anything like that in sight. However, he stressed the difficulty of providing a response from a complex reality such as the Eurozone where 19 economies coexist. Draghi pointed out that 'there are countries with fiscal space and countries that have no fiscal space'. On these difficulties, the Italian banker reiterated the importance of gradually progressing towards an optimal monetary union and achieving collective convergence. In this regard, the President of the ECB welcomed the document proposed by the governments of France and Germany, which he said was 'an encouraging step in this direction'. With this news the Italian and Spanish markets are falling sharply. As a result, demand for German debt soars. Specifically, these people will be in the Budget Committee of the Lower House of Parliament and the Finance Committee of the Senate. They're both against budgetary limits. Banks are once again falling because of the reduced outlook for economic activity, a certain delay in the rise in interest rates and political instability that seem to have no end in the eurozone. Asian markets were mixed on Monday, June 25, with investors trying to break free from the nerves of U.S.-China trade tensions. In Australia, the ASX 200 benchmark index fell, with the financial sector heavily weighted. The major banks suffered. The energy sector improved, with increases in the main companies in this sector. Trump threatens a 20% tariff on all car imports from the EU. The threat comes just two days after Commerce Secretary Wilbur Ross said no decision had been made on whether the United States would extend new tariffs, similar to those on other products, to the auto industry. The new tariffs affect companies such as BMW, Volkswagen, Fiat Chrysler and the Mercedes Daimler manufacturer. Ford and General Motors shares also fell after the news. The EUR rose on Friday as investors were encouraged by economic growth data and new assurances from Italian politicians that their country would not abandon the single currency. OPEC ministers agree to increase oil production. They announced on Friday an agreement that will increase oil supply, after limiting production to balance the market and raise prices over the past eighteen months. The agreement came after a week of tense negotiations in Vienna. The main producer, Saudi Arabia, faced the challenge of convincing a handful of reluctant producers, including Iran, Iraq and Venezuela, to support an increase in production. While OPEC avoided the disastrous result of ending the week without an agreement, it left the oil market somewhat disappointed by not announcing a concrete figure. Brent crude oil prices fell by more than 2 percent in the early hours of Monday's Asian session. Gold prices rose sharply on Monday in Asia, with the EUR holding off the Dollar from its 11-month high, and as U.S.-European Union trade problems continued to support safe haven assets. Profits on Wall Street after OPEC's production increase. 0.5% gains on Wall Street on Friday, June 22, as the market and investors follow closely the outcome of the OPEC meeting. The Dow Jones is thus breaking its run of eight consecutive sessions in negative. OPEC met on Friday to discuss the future of oil and reached an agreement to increase production to one million barrels a day. In real terms, the increase will be less than this figure. It will be only between 600,000 and 800,000 barrels, as not all the cartel countries are in a position to increase their pumping capacity in the coming months. A small dose of good news in the euro area. The euro zone is positive on Friday, June 22, with clear gains in most European index futures. The banking supersector is the best of all, so the Ibex 35 has the advantage, after the news that all the banks have passed the stress tests in the United States. They can now distribute capital to their shareholders, which is an important support. The bond market is experiencing clear declines in profitability on the periphery, thanks to the news that Greece has managed to exit the bailout programme. In the end, what about OPEC? In the end, after news appeared that an agreement has been reached to increase production, and also the opposite, what seems to have happened is an intermediate solution. The information is that if an agreement has been reached to increase production by one million barrels, the problem is that countries that have produced less than expected will have problems to increase it. What remains to be produced cannot be supplied by other countries. Therefore, the reality is that the increase in production will be much lower. A spokeswoman for the German economy ministry hopes that the European Union's reactions to the US tariffs will bring some sense to all concerned and hopes that a solution will be found. A spokeswoman for Teresa May is also referring to the EU's plans against US tariffs. They advise that they will discuss these measures with Trump on their next visit to the UK next month. The scare continues after the ruling of the US Supreme Court, which allows for the payment of taxes on online sales made within its territory. Amazon has problems and the impact on the markets has not yet been discounted. Paul Tudor Jones, the legendary investor and market guru who predicted the crash of'87, is clear that 'the next recession will be terrifying'. Tudor Jones pointed out that 'we will have a monetary policy that will run out very quickly, but we don't have fiscal stabilizers’. The billionaire investor also said that the dynamics created by the Federal Reserve to normalize rate policy is unsustainable. Asian markets fell on Tuesday, June 26, with China leading the way. Investors remained concerned about the escalation of the U.S.-China trade dispute. In Japan, technological actions were on negative territory. The markets in Greater China recovered slightly after a bad start to the morning. In Hong Kong, the Hang Seng index fell with all sectors, except the telecommunications sector, trading lower. MSCI's Asia Pacific equity index, excluding Japan, traded down 0.27 percent at the end of the session. The US actions began the week on a bitter note as Wall Street prepared for more punitive actions against Chinese companies by the Trump administration. The Dow Jones Industrials fell 328 points, with Boeing and Intel being the worst. The Dow rebounded slightly in the last hour of trading after Peter Navarro, one of the president's top trade advisors, said that investment restrictions against China and other countries are not immediate and that the market was overreacting. The Dollar fell against the Yen on Tuesday to a two-week low. Concerns about a possible intensification of the fight between the United States and its trading partners continued to reduce risk appetite. Oil prices rose during Tuesday's Asian session due to uncertainty over Libyan oil exports, although the OPEC producers' cartel's plans to increase production remain unchanged. Gold prices rose sharply on Tuesday's Asian trading session, as the Dollar fell to a two-week low against the Yen. U.S. Government Debt prices rise on Monday, June 25. The yield on the 10-year Treasury bond stood at around 2.882 per cent, while the yield on the 30-year Treasury bond stood at 3.032 per cent in red. Bond yields move inversely with prices. European stock markets open the week with falls. They do so after Friday's announcement of possible new tariffs on European vehicle imports. It is a day on Monday 25th June without any major macroeconomic references. A very interesting moment, from several angles, in which the Ibex and the DAX are involved. The proportion of banks in the Ibex is very high and that of car manufacturers and the automotive sector is also very high in the DAX. An environment that is harmful to exporters will have a negative impact on the DAX. If the banks are doing well and the cars are doing worse, it means the Ibex will do better than the DAX. The DAX declines and their values show this situation. It values the spread between 1-3 year and 7-10 year bonds. Business confidence in June, calculated by the IFO Institute, goes from 102.2 to 101.8. It's a tenth above expectations. With regard to the assessment of current conditions, the figure has been increased from 106 to 105.1. It was expected to end at 105.6. With regard to the vision of the future, expectations improve very slightly, from 98.5 to 98.6. It's a hell of a lot better than expected, than leaving the figure at 98. During the whole year 2018 there are only drops. The recovery from the lows of the end of 2012 or 2013 is in danger. The fear of commercial warfare is leaving its mark. Not only has the situation not improved over the weekend, but it has worsened following the news that the Chinese will be limiting their investment in technology in the United States. Chinese investment in companies in this sector will be hampered. The market spent a lot of time thinking that Trump was bluffing to get advantages but, little by little, it’s easy to see that he was very serious. China continues to seek to occupy the space left by the US withdrawal at the international level. The Chinese Premier says they are still willing to open up their market further and are seeking to promote trade cooperation with France. Such cooperation could result in the purchase of more agricultural products. In addition, they also want to buy aircrafts, so Airbus is in luck and the damage to Boeing will be considerable. Vasiliauskas from the European Central Bank says that economic growth in the euro area remains on a solid footing. It acknowledges that downside risks have increased mainly due to the escalation of trade tensions. It calls on the Agency to review its current monetary policy for the autumn of 2019 and assures that it sees no need to extend the monthly asset purchase programme beyond December. Asia's major markets were mixed on Wednesday, June 27, with continued oil price increases and worrying headlines related to the trade war. The Nikkei 225 fell and the financial and utilities sectors were the worst. However, actions in the energy sector rose, supported by the sudden rise in oil prices. In Seoul, the Kospi inversed the initial profits to fall in the end. The good progress of the technologies did not manage to boost the index, due to the falls in the rest of the sectors, including the automobile and steel manufacturers. In Australia, the energy sub-index rose as oil producers improved. Investors are suffering from the uncertainty generated by members of the Trump Administration. They do not seem to agree with each other on trade policy. Recent initiatives have caused much market volatility. Many different options are being tested in the White House, which does not help to generate stability. The Dollar rallied against most of its major counterparts on Wednesday, after a two-week low against most of its major counterparts. Oil prices rose in the Asian session on Wednesday, driven by supply disruptions in Libya and Canada and after U.S. officials said all countries should stop Iranian oil imports starting in November. The companies buying Iranian crude oil must completely cut off those imports by early November or else they will face powerful sanctions from the United States. The State Department has conveyed that message to European diplomats in recent talks. The Trump government has not yet held talks with China, India or Turkey about their purchases of Iranian crude oil, but intends to push for them to cut their imports completely. Gold fell to a six-month low as the dollar appreciated and risk aversion and expectations of further interest rate hikes from the Federal Reserve remained strong. The search for safety is still a long way from raw materials. Gold is falling 1.1% on Tuesday, June 26th. As it is an active safe haven, many investors expect that if the time comes for economic problems the search for safe haven in the yellow metal will increase. The automotive and parts supersector is trying to hold its own. It bounces on Tuesday, June 26th, after Monday's steep descents. There is one point in favour which is the improvement of recommendation on Renault by Morgan Stanley. On the other hand, BMW is one of the worst on the German index, when they had to remove some suspicions about information that it was leaving the UK. The brand's special envoy to the United Kingdom said that BMW is committed to this country, to the factories and to the workers. Hanson of the European Central Bank assures that the Agency's monetary policy, chaired by Mario Draghi, continues at accommodative levels. These are statements that came out two weeks after the ECB sent its first messages on reducing tapering. It is known that the ECB will halve the monthly volume of asset purchases. It will do so up to €15 billion between September and December. For the time being, they are moving away from the first interest rate hike, at least until after the summer of 2019. Iran's energy minister, Bijan Zanganeh, says last week's OPEC agreement did not contain an increase in production, as some members interpreted it. Iran's suggestion was first to balance the oil on the market, guarantee members 100% in accordance with the agreement and then decide on an increase in production at the next meeting, if necessary. Crude oil prices are rising due to supply restrictions from Canada's failed refinery and cuts in oil ports in northern Libya. The origins will be Bangladesh, India, Laos, South Korea and Sry Lanka. The cuts will be effective as of July 1. The new trade opening measure is taken to counteract the drop in Chinese stock markets by more than 20% from the annual highs set in January this year. Tensions with the United States have eased somewhat in recent hours. The White House has said there are currently no plans to impose restrictions on foreign investment in key U.S. sectors, including technology. 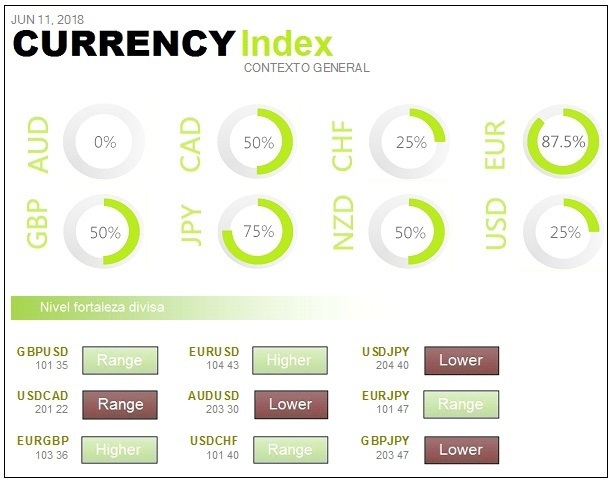 The EUR fell against most of its major currency crosses, except the Pound, as this currency was damaged by comments about the impact of the UK's exit from the European Union. Overall, there is a further increase in the Dollar Index, which does not get along with risky assets. The higher the dollar is, the more downward pressure there will be on the United States. Asian equities were mixed on Thursday, June 28, as investors digested events related to the U.S. position on foreign investment. In Tokyo, the Nikkei 22 finished on its daily low. The airlines continued their decline. The Kospi also dropped, as technological actions tried to defend themselves. The markets of Greater China gained some respite after the recent loss sessions. Hong Kong's Hang Seng index rose as energy stocks and the information technology sector strengthened. The S&P/ASX 200 reversed its trend to end up trading higher, with gains in the financial sector strongly weighted. The energy sub-index also contributed to the gains. Markets in Vietnam were closed on Thursday. The mixed tone in Asian markets came after the U.S. government announced its intention to address the issue of foreign acquisitions of U.S. technologies. The current position is considered to be softening towards China. Still, U.S. Treasury Secretary Steven Mnuchin said Wednesday that his country could block joint ventures if there are technology transfers. U.S. stocks closed lower on Wednesday, erasing initial strong gains, as positive news on the trade front was not enough to halt the decline in technological and financial stocks. The Dollar held steady against most of its major currency pairs on Thursday's Asian trading session. It failed to move forward following Washington's comments regarding the possibility of restricting Chinese investment. The imminent close of the semester supported the Dollar, which was able to challenge low yields in the U.S. and the fall in Wall Street stocks. Oil prices fell from their three-and-a-half year highs, while physical markets remained well-supplied despite record demand and continued production shocks. Gold fell to a six-month low on Thursday in Asia, as the dollar failed to advance and trade disputes between China and the U.S. deepened. S&P confirms its 'AA+' rating on the US with stable outlook. Good news for America on Wednesday, June 27. The S&P credit rating agency has confirmed the 'AA+' rating on US sovereign debt and has kept its outlook stable. The rating agency believes that trade tensions will not have a short-term impact on the U.S. economy. Undercover Quantitative Easing of the European Central Bank. It is a proven fact that the ECB has a very important covert QE. No headlines are created, the QE is not over. The European Central Bank, unlike the Federal Reserve, is not reducing its balance sheet at the moment and the maturities it receives are being covered by more purchases. It's a covert relaxation program until they decide if they decide, to stop covering their maturities. The tension between the experts gradually manifests itself. Managers reduce risk positions and are committed to security. ‘American First' politics is a concern for the global economy. In addition to undermining trade relations and trust between partners, it generates a revenge spirit whose evolution and final outcome is unknown. From its scope, different scenarios are derived for economic evolution and, therefore, for the stability of financial markets. In a matter of months, it has chosen to move away from established criteria, between the United States and most nations. The criteria have served for years to safeguard coherence and order in economic growth. Trump disregards international agreements in terms of the environment, human rights or trade. In a show of intent, he has also decided to significantly increase defence spending and spur the already difficult situation in the Middle East. The U.S. trade deficit has been a structural and chronic problem for decades. This has served as an excuse to act as a victim and to propose measures to protect his interests. The United States is steadily increasing its production. If OPEC and Russia do not, the United States will take their place. The problem is with countries that cannot find a substitute for Iran's oil, because it opens the door to the need for the United States to supply it, which would leave them vulnerable to Donald Trump's changes in temperament. It is a kind of game in which dependence on oil from the United States can be another weapon of pressure to complement the trade war. As if the dismantling of international trade by the United States was not enough, the use of new sanctions against Iran could upset the whole international balance. The rise in the price of crude oil has favoured the increase in new installations in the United States. Oil prices are at their highest this year and there has already been a warning from OPEC and Russia that the market has sufficient demand to be able to withstand an increase in production. Asian equities rose on Friday, June 29, the last trading day of the quarter. China recovered slightly from its recent decline amid concerns about trade tensions between Washington and Beijing. Japanese equities declined, with banks and pharmaceuticals leading a timid upward movement and major exporters showing mixed results, despite the yen's broad decline. In South Korea, most technological stocks rose and financial stocks also contributed to the gains. Australia's S&P/ASX 200 drifted higher. In China, the consumer goods and information technology sectors led the gains. China is spending billions to develop an army of robots to power its economy. The recovery came after China took steps to reduce restrictions on foreign investment in industries and the financial sector. Globally, equities have the largest outflows of capital since the last financial crisis. Investors' money is flowing out of global equity funds at a rate not seen since the financial crisis erupted. Global equity funds recorded outflows of $12.4 billion in June, a level not seen since October 2008. Lehman Brothers collapsed in September of that year, causing the worst economic recession since the Great Depression and helping to fuel a bear market in which major indices would lose more than 60 percent of their value. The consequences of the normalization of US monetary policy, moderately higher inflation and trade tensions between the US and China top the list of concerns. However, these factors do not change the broadly optimistic view of global economic growth. Yet investors are aware that the combination of worsening trade performance, rising oil prices and an aggressive Federal Reserve may further erode confidence in 2018 and beyond. In the United States, the banking and technology sectors led the way. U.S. indices recover from past losses. 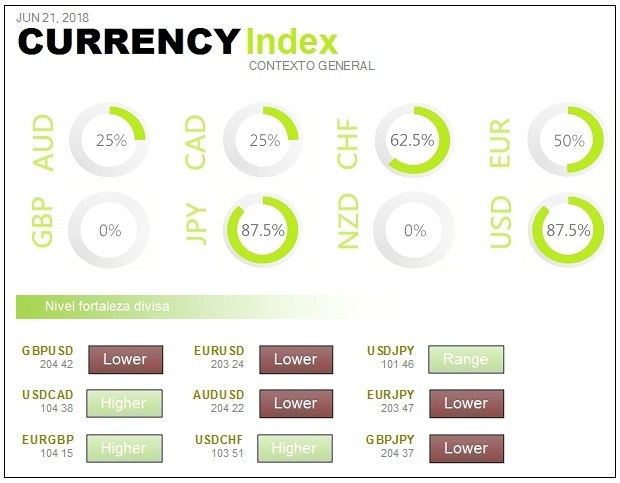 The Dollar held steady against the Japanese Yen on Friday, driven by quarter-end purchases and the absence of any further escalation in trade tensions between the U.S. and its major trading partners. On Friday, oil prices remained around the three-and-a-half year highs reached the previous day. A cut in Canadian supply, due to a breakdown, has lowered production. Gold prices rose sharply on Friday after reaching a six-month low. The Nasdaq loses 7,000 points. How far can it correct? At the moment the supports are holding and that makes it necessary to be aware of possible rebounds. The oil sector is showing clear rises and is holding back the rise of Wall Street. It happened after Trump said that from November onwards it will be forbidden to buy oil from Iran because of the reactivation of trade sanctions. Technology dropped sharply on Wall Street, especially the semiconductors that were hard hit by the trade war, which was very damaging to them. The two and ten-year yield curve in the United States is flattening out to the minimum level of August 2007. It was just a few months before the 2008 crash. The `Investors Intelligence' survey of professional managers gives an 18% bassist rate. The sentiment is still overconfident for a time like this. Europe is in the negative because no conclusions have been drawn. In the euro zone, there has been some stabilisation in general, but it is confirmed that consumer confidence in June is falling and that economic sentiment is falling, but less than expected. To highlight the European Central Bank's warning that the economy within the eurozone remains large and resilient. The labour market is also expected to improve, but it makes it clear that the risks to global economic activity have been worsened by the prospect of the trade war. We have to be strong to think for ourselves, distrusting the things that most of the market gives as true. It is necessary to have a very critical mind and always think that a false signal may be reaching us to achieve the opposite of what it seems. These are not conspiracy theories. The marketplace is a bloody place, if you like, where the one across the street is not a friend but surely the enemy. As the poker players say, if you sit at the gaming table and don't find the fool they all want to pluck, then you're the fool. Cramer described a variety of tactics that hedge fund managers use to affect the price of a stock. One strategy to keep the price down is to spread false rumours to the press. He also discussed how to give the journalist on duty at The Wall Street Journal information to publish an article. He said this practice, though illegal, is easy to do because the SEC doesn't understand it. The manipulation of the stock market by the big players is a major problem. Few cases are known but, like cockroaches, if you can find one, there are many more. On the one hand, the pressure on May for the Brexit continues to increase, both on the part of the public and on the part of the business community. There are many business statements to the effect that if there are no agreements with Europe, they will leave the country. See the Bank of England's comment that we should prepare for a global rate cut is extremely worrying. The Vice Governor of the BoE says that cryptographic assets have shown high price volatility and relative lack of liquidity. It considers that many of these assets are vulnerable to fraud and manipulation, along with money laundering and the risk of terrorist financing. They have asked banks, insurance companies and investment funds to have appropriate risk management systems if they invest in cryptographic assets. They expect companies to inform their supervisory contact of anything they intend to do when exposed to 'cryptoactives'.